What is axon guidance and the growth cone? Axon guidance is an important step in neural development. It allows growing axons to reach specific destinations and ultimately form the complex neuronal networks throughout the body. Although many aspects of this mechanism remains unclear, it is well established that a dynamic and highly motile actin-based structure found at the growing end of a developing axon, known as a growth cone, facilitates this process. Organization of cytoskeletal components (actin filaments and microtubules) in the growth cone. Growth cones facilitate axon growth and guidance by bundling and extending actin filaments into structures known as filopodia and microspikes. Binding of filopodia and adhesion receptors to particular extracellular matrix (ECM) components or ligands is translated into actin filament assembly, cytoskeleton remodeling and force-driven motility. These events culminate in the growth of the neuron towards its target. Growth cones contain a number of cytoskeletal components that are organized into three regions; the peripheral (P) domain, the transitional (T) domain and the central (C) domain . The P domain is primarily composed of unipolar actin filament bundles embedded in a less polar actin network. It contains dynamic lamellipodia and filopodia. Microtubules are also transiently found within this domain. The T domain is a thin interface between the P and C domains. The C domain is located in the center of the growth cone nearest the axon. It is primarily composed of microtubules and contains numerous organelles and vesicles. 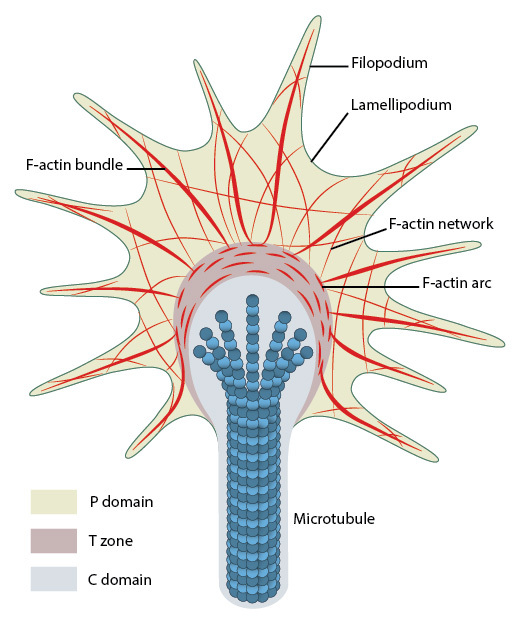 A number of cytoskeletal-associated proteins are present in growth cones that anchor actin filaments and microtubules to each other, such as myosin II , or to the membrane, for example, talin , and to other cytoskeletal components. Molecular motors present in growth cones produce the forces needed for growth cone migration (e.g. myosin II ) and vesicle transport in and out of the growth cone (e.g. kinesin superfamily protein member 4, KIF4 ). How do neurotrophins, collapsin, and ephrins, serve as guidance cues?